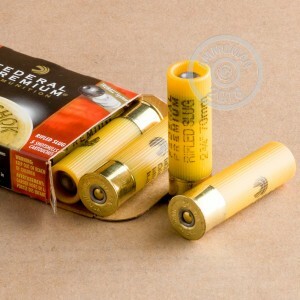 If you're using a smoothbore shotgun this deer hunting season, don't leave home without some 20 Gauge Truball HP Rifled Slug ammo from Federal to go along with it. Federal's Truball slug is designed with a plastic ball between the wad and slug. This simple ball centers the slug in the barrel, resulting in a shot that is more accurate. These rounds penetrate deep, leaving a devastating wound, sure to take down your big buck. The muzzle velocity of this slug is 1600 feet per second and muzzle energy 1864 ft/lbs. 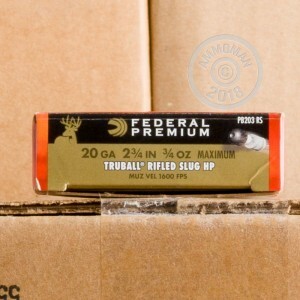 Your 5 rounds of Rifled Slug ammo will arrive to you in brand new condition with fast shipping. Founded in 1922, Federal Ammunition Company produces some of the best shotshell, centerfire, and rimfire ammo and components on the market. Manufacturing takes place at their headquarters in Anoka, Minnesota. Their "Premium" category of ammunition is their flagship brand and competes with other leading manufacturers by staying on top of the most current technology. Many of their products have won awards from the most prestigious organizations in the industry.